This Sukkot, Do You Still Use Your White Cardboard Esrog Box? Living "Out of the Box"
A time, as well, for blessings said daily over the lulav and etrog, which are rich in symbolism and meaning. Sukkot is my very favorite holiday, and I will be posting, at most, intermittently, in the week ahead. I pick up here with an apology (and thanks to Buddy): in my rush to post about Prime Minister's speech at the UN last week, immediately after he spoke, I inadvertently picked up a URL for an old speech of his and not the one he had just given. Now I would like to return to that speech by Netanyahu. First, to restate my original response, that it was an excellent speech. Labels: Netanyahu At The UN, Will Israel Attack Iran? Rabbi Zevulun Charlop - "Zeh Hakadosh Baruch Hu"
Rabbi Joshua Flug - "The First Night of Sukkot: Is This Night Different?" Rabbi Meir Goldwicht - "U'Pros Aleinu Sukkat Shelomecha (Hebrew)"
Rabbi Yosef Kalinsky - "Shmini Azteres: A Nuanced and Contemplative Time"
Mrs. Deena Rabinovich - "Thematic Connections between Hakhel and Sukkot"
Rabbi Kenny Schiowitz - "From Too Particular to Too Universal and Back Again"
Rabbi Mordechai Torczyner - "Succot: Celebrating our Dependence"
Will Events In Middle East In September Be Remembered In Election In November? Judd Gregg, a former Republican senator from New Hampshire and President Obama's first choice for Secretary of Commerce, penned an op-ed piece two months ago entitled "Heading toward a Sept. surprise," in which he noted that September has often proven to be a month of disaster. The Great Depression started in September (though Black Monday came in October); in 2008, Lehman Brothers and Bear Stearns both failed in September, and the world stood on the brink of another massive depression. Gregg even offers a partial explanation for September's unfortunate prominence: "It seems September is the point in the year where people assess where they have gone, and what the next year will be like, and make investment decisions based on their conclusions." One thing Gregg does not do, however, is note that September almost always overlaps with the Days of Judgment, when Jews too assess where they have gone astray in the past year and where they would like to go in the year to come. Considering some of the negative reviews Netanyahu's speech to the UN is getting, maybe the problem is that the speech was too dry. As you can see, that is a drawing of a bomb. It is divided into three stages. 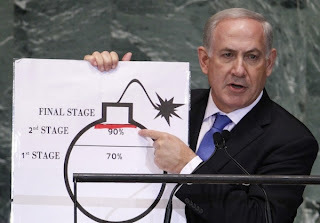 Iran has completed the first stage (amassing enough 70 percent-enriched uranium for a bomb), and, according to Netanyahu, can complete the second stage (amassing enough 90 percent-enriched uranium) as soon as next summer. The key here — and this is important — is to stop Iran before it enters the final stage, i.e. the completion of the bomb. Let’s hope the White House was paying attention. Well, if the whole point was to get the White House to pay attention (no small feat), maybe Bibi could have utilized his other skills. Here is a video -- made with IDF approval -- of an IDF recruit shuffling through IDF basic training, from the day of his enlistment to the day of his swearing in. It's the season of speeches at the UN. As some of what has been going on coincided with my preparations for and observance of Yom Kippur, I will need to back-track a bit before moving forward. And forward is where I truly want to go (see the last of this posting!). Iran President Mahmoud Ahmadinejad actually spoke twice at the UN this week. He kicked off his visit with an address on Monday at a UN session on the rule of law -- itself a travesty of everything fair and reasonable. And his comments there were every bit as vile as might have been expected. He said that Israel had "no roots" in the Middle East. "We don’t even count them [Israelis] as any part of any equation for Iran,” he declared. "They represent minimal disturbances that come into the picture and are then eliminated." Eliminated. Labels: Ahmadinejad at the UN, Netanyahu At The UN, Will Israel Attack Iran? 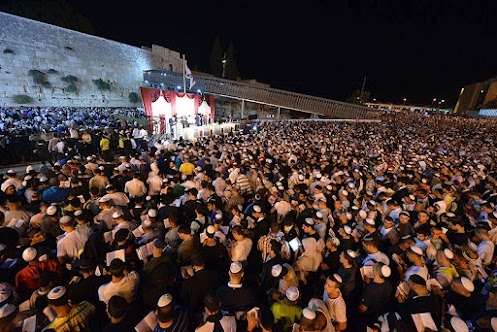 Toldot Yisrael presents a video that tells the story of six Jewish heroes who defiantly blew the shofar at the Kotel (Western Wall) over sixty years ago, when it was illegal to do so in British Mandatory Palestine. The British passed a law in 1930 forbidding Jews to blow the shofar at the Kotel, pray loudly there, or bring Torah scrolls, so as not to offend the Arab population. Despite this restriction, for the next seventeen years, the shofar was sounded at the Kotel every Yom Kippur. 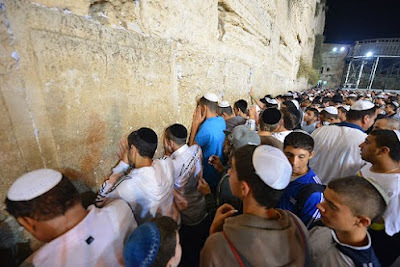 Shofars were smuggled in to the Kotel where brave teenagers defiantly blew them at the conclusion of the fast. Some managed to get away - others were captured and sent to jail for up to six months. Two weeks ago, these six men returned to the scene of their "crime". Armed with shofars, they recounted their individual stories and blew shofar again at the Kotel. Echoes of a Shofar is the premiere episode in the "Eyewitness 1948" short film series produced by Toldot Yisrael and the History Channel. It is the centerpiece of an educational pilot program developed with The iCenter and made possible through the generous support of the Jim Joseph Foundation and others. Two Christians living in the Islamic world under arrest and awaiting execution—the one charged with apostasy, the other with blasphemy—were just released. According to a September 8 report on CNN, "A Christian pastor sentenced to death in Iran for apostasy was reunited with his family Saturday after a trial court acquitted him... Pastor Youcef Nadarkhani, born to Muslim parents and a convert to Christianity by age 19, was released after being held in prison for almost three years under a death sentence.... Setting aside the death sentence, a trial court convicted Nadarkhani of a lesser charge—evangelizing Muslims—and declared that his prison sentence had already been served... His case drew international attention after his October 2009 arrest, and the 34-year-old pastor refused to recant his Christian beliefs." In a separate story published the same day, "Pakistani authorities on Saturday released a teenage Christian girl detained over accusations of blasphemy," for allegedly burning pages of a Koran. Up till then, local Muslims were calling for the death of the 14-year-old Christian girl, Rimsha Masih, warning that, if released, they would "take the law into their own hands." Why were these two Christians released—when both apostasy and blasphemy are great crimes in Islam, punishable by death? Is this a sign that Iran and Pakistan are reforming, becoming more "moderate"? One U.S. paper, for example, optimistically offers the following title, "Rescue of Christian Girl may be Turning Point in Abuse of Blasphemy Law." Labels: Election 2012, Is Obama A Friend Of Israel? This is the image that will be taken away from Netanyahu's speech today before the UN. The question is whether it will be effective in making Netanyahu's point. Labels: Will Israel Attack Iran? Labels: Is Obama A Friend Of Israel? I also received some thoughtful responses, and read some in the media, including one, in Haaretz, from Chemi Shalev who wrote the following: "In the discussion that followed Netanyahu's appearance on Meet the Press, it was instructive to hear Atlantic magazine and Bloomberg blogger Jeffery (sic) Goldberg - whom right wingers consider to be a leftie, left-wingers view as a rightie and most Jews embrace as a voice in the middle - say that 'I have never seen a prime minister who has mismanaged Israeli-US relations like Netanyahu.' And while Goldberg's stature may be light years away from that of the legendary Walter Cronkite, my immediate association was to the oft-told but never-proven account of Lyndon Johnson's reaction to Cronkite's assertion in early 1968 that the Vietnam War was unwinnable: "If I've lost Cronkite, I've lost middle America." Labels: Election 2012, Is Obama A Friend Of Israel?, Will Israel Attack Iran? President Barack Obama’s speech is a fascinating document. The theme is this: absolutely nothing can go wrong with political change in the Middle East and that the United States helps moderate forces, defined as anyone who isn't actively trying to kill Americans. The fact that some to many of those revolutionary forces favor killing Americans is outside his purview. And the fact that his policy has supported militantly anti-democratic groups far more than the (far weaker) moderate ones is airbrushed away. “On Yom Kippur, the holiest day on the Jewish calendar, Jews worldwide spend the day in fasting, prayer and repentance. Yom Kippur is not a day for politics. But Yom Kippur 5773 is different. People carrying pro-American signs pushed their way into the encampment of Ansar al-Sharia, which in spite of its denials is suspected of complicity in the death of Ambassador J. Christopher Stevens and three other Americans. The militants were forced out of the base, and the demonstrators burned part of it before turning it over to the Libyan army. On Sunday, the interim government, which had been wavering on how to react to the assault on the consulate, ordered the dismantlement of all militias not under its authority and said they must withdraw from government property within 48 hours. In Egypt, where the government’s slow reaction to protests outside the U.S. Embassy in Cairo prompted a phone call from President Obama to the newly elected Islamist President Mohamed Morsi, there has been a chorus of condemnation of the violence, with the country’s most prestigious sheiks and other Islamic leaders calling it shameful and contrary to Islam; some even issued fatwas against it. The Middle East Media Research Institute has documented numerous commentaries by newspaper columnists warning against incitement by radical groups. Yes, to be sure, the pro-Americanism of many in Libya is encouraging. But, as Barry Rubin explains problems in Libya undermine the friendliness of its current government. Tomorrow, the Supreme Court is expected to announce whether it will review the case of Sholom Rubashkin, who has attained cause celebre status for the remarkable events surrounding his trial and sentencing. Everything about this case is BIG. Months of planning and hundreds of agents went into pulling off a 2009 raid at Rubashkin's kosher meat packing plant in Postville, Iowa. More than 375 workers were arrested -- many ultimately deported -- and hundreds of charges lodged against Rubashkin alleging child labor and immigration law violations. He was acquitted of every one. President Obama is fond of boasting about his foreign policy prowess and is anxious to use his UN General Assembly address on September 25 to amplify that claim. His competence took a hit this past week after he pontificated on CBS – less than 24 hours after the murder of our Libyan ambassador – that as president he’d “learned” you have “to make sure that the statements that you make are backed up by the facts.” It turned out that he didn’t have the facts, but he and his officials kept yakking anyway. One of those sent out to face the fire, UN Ambassador Susan Rice, will be front and center at the American desk in the Assembly Hall as the president makes his UN pitch. Rice’s implacable insistence that the ‘video-done-it’ has been widely ridiculed, and is now disputed by the White House itself. In fact, the administration’s video-fixated apologies appear to have been fueling the flames. The answer will be clearer after hearing the president’s speech, but the answer – to borrow a word from White House Press Secretary Jay Carney – is self-evident. She was taking her cue from the top. Is There A Media Blackout On Those Muslim Riots? If you can't keep track of all the Muslim protests erupting across the globe, you're not alone. The uproar over a 14-minute anti-Islam YouTube video has sparked furious protests from Somalia to Egypt to Sudan to Tunisia to Libya to Bangladesh to Indonesia to Pakistan. With new reports of protests surfacing every minute, we've compiled the latest reported incidents into this handy interactive Google Map. Click the locations and embedded links for more details about each incident. To stop Islamist violence over perceived insults to Muhammad, I argued in a FoxNews.com article on Friday, editors and producers daily should display cartoons of Muhammad "until the Islamists get used to the fact that we turn sacred cows into hamburger." This appeal prompted a solemn reply from Sheila Musaji of The American Muslim website, who deemed it "irresponsible and beyond the pale." Why so? Because, as she puts it, "The solution to escalating violence and hate speech is not more hate speech." depicts Muhammad as a lawgiver. That sounds sensible enough. But does mocking Muhammad, burning a Koran, or calling Islam a cult constitute hate speech? And what about the respectful representations of Muhammad in the buildings of the U.S. Supreme Court or the New York State Supreme Court? Even they caused upset and rioting. As I count down the time until Yom Kippur (the Day of Atonement, which begins tomorrow at sundown), I find myself grieving over the state of this world of ours. In the course of Yom Kippur, we recite Viddui -- communal confessional prayers -- several times, beating our chest with our fist as we do so. I am of the opinion that a world-wide Viddui with a great deal of breast-beating is in order. Forgive us, our Creator, for we have sinned. For the world is without moral compass. On Wednesday, the day of Yom Kippur itself, Ahmadinejad will be addressing the General Assembly of the UN. He will not be barred from entering the US, and he will not be arrested for inciting to genocide. The Israeli government is asking at least that representatives of nations present in the hall get up and leave when he speaks. I have no illusions that any but a miniscule number of representatives will do so. Because the world is without a moral compass. Because I am very careful to avoid sharing undocumented rumors, there are stories that make the rounds that I am reluctant to touch -- even as there is a growing conviction within me that they may be true. But sometimes I reach a tipping point at which I know it's time to write. Every Middle Eastern despot has to have a hobby, a diversion -- for when they are not busy killing their citizens or showing off by threatening the United States. As it turns out Mahmoud Ahmadinejad has one too. In his spare time, Ahamdinejad likes to do impressions of famous people, both fictional and real. Reporters David Kirkpatrick and Steven Erlanger interviewed Egyptian President Mohammed Morsi. Given the lack of challenging questions and the reporters silent approval of Morsi's answers, it was designed less as a profile of Morsi than trying to show his good side to an American audience. Though the reporters don't choose the headlines, the headline Egypt’s New Leader Spells Out Terms for U.S.-Arab Ties, gives some sense of the article: it's on Morsi's terms. Barry Rubin: What Does Israel Do if Obama Is Reelected? Barry Rubin addresses the question: What Does Israel Do if Obama Is Reelected? The Middle East Media Sampler 9/23/2012: Palestinian Apologists Defend Against Romney "Gaffe"
1) The Romney Middle East "gaffe"
“The idea of pushing on the Israelis to give something up to get the Palestinians to act is the worst idea in the world,” Romney said. The New York Times has since published three responses to those statements. It is amazing how events in international affairs that would have been easily and accurately understood decades ago are now surrounded by obfuscation and misunderstanding. Such is the case with Libya and the U.S. role there. Forget Obama's Cairo speech and all that bowing, apologizing, appeasing, and empathy. All of it is meaningless now. The facts are clear. Along with its NATO allies, the United States helped overthrow the dictatorship of Muammar Qadhafi in Libya and installed a new regime. This government, non-Islamist, technocratic, and led by defected old regime politicians or former exiles, won the election and is now in power. What does this mean? Simple. Libya is now a U.S. client state. In the eyes of many Arabs and Muslims—especially the radicals but not just them—Libya is now an American puppet state. What underwater animal do you most associate with protection? When I was a kid, Flipper was a big deal. After all, dolphins are smart and cool to watch. And don't forget the movie Day of the Dolphin. A dolphin would be a cool model for an underwater robot. A 6-minute film that can change how you pray over the High Holidays. I only wish I had seen this video before Rosh HaShanah. Barry Rubin: The Syrian Tragedy: Is the Proposed Cure Worse Than the Status Quo?. Barry Rubin asks the question The Syrian Tragedy: Is the Proposed Cure Worse Than the Status Quo?. At issue is the proposal to deal with the horrendous slaughter of Syrians by the Assad regime. The most obvious answer, especially in light of Western actions in the case of Libya, is to intervene and aid the rebellion against Assad. The day ends earlier now, and Shabbat comes in sooner. By next week it will be considerably sooner yet, as we turn back our clocks here on Saturday night. Here is the latest edition of Latma. It features a lampooning of Obama's Middle East policy. So in this season of new beginnings I would like to speak clearly to Iran's leaders. We have serious differences that have grown over time. My administration is now committed to diplomacy that addresses the full range of issues before us, and to pursuing constructive ties among the United States, Iran and the international community. This process will not be advanced by threats. We seek instead engagement that is honest and grounded in mutual respect. But the First Amendment isn’t the problem here, the dysfunctions and inadequacies of the Arab and Muslim world are. In my last post, I presented Pat Condell's latest video, where he goes on a rant about the Muslim riots. I posted that video with a sort of guilty pleasure. Listening to Condell--and if you have listened to him before you know what I mean--I felt like I was vicariously venting along with him. One criticism I saw of this particular video is that Condell is lumping all Muslims together when he rips into the Muslim rioters and their pretenses. Amidst all of the talk of religious tolerance and the hand-wringing over free speech in recent days, one salient fact is often lost or glossed over: What we face are not broad questions about the limits of free speech or the importance of religious tolerance, but rather a very specific question about the limits of Muslim tolerance and the unimportance of free speech to much of the Muslin world. It’s really quite amazing. In Pakistan, Egypt, and the Palestinian territories, Christians are being harassed, brutalized, and even murdered, often with state support, or at least state indulgence. And let’s not even talk about the warm reception Jews receive in much of the Muslim world. And yet, it seems you can’t turn on National Public Radio or open a newspaper or a highbrow magazine without finding some oh-so-thoughtful meditation on how anti-Islamic speech should be considered the equivalent of shouting “fire” in a movie theater. That really is Pat Condell's argument in a nutshell--and without the "colorful" language. Thankfully, there is no overt apology -- and Obama does in fact condemn the Muslim violence. Obama's claim that "we reject all efforts to denigrate the religious beliefs of others" runs in the of the fact that this is free speech and the US government in fact does not -- and cannot -- reject those 'efforts'. It sounds absurd to hear Hillary Clinton reassure Islamic extremists about our commitment to religious tolerance when those same extremists don't even share our belief in religious tolerance. Islamists rioting in the street--burning embassies, murdering people and threatening violence should not distract us from the fact that Islamists are rioting in the street--burning embassies, murdering people and threatening violence. Those Muslims rioting in the street are the problem, not free speech. Technorati Tag: Free Speech and Islamists and Islam. Pat Condell is always blunt, and yes, even offensive. But in this case -- compared to the those who still say we should tip-toe so as not to offend the Islamists -- Condell is venting for those who need a counterweight. And if you pay attention, you'll note that at the very end Condell does not end with his customary "peace". This time, Condell is angry. And we should be too. "I would say yes, they were killed in the course of a terrorist attack on our embassy..."We are looking at indications that individuals involved in the attack may have had connections to al Qaeda or al Qaeda's affiliates; in particular, al Qaeda in the Islamic Maghreb. Why Can't The Media Be Relied On To Cover Obama Objectively? When they needed it most, the Democrats put on a nearly flawless convention. 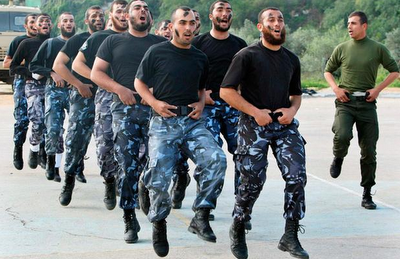 What Is Really Happening In The Middle East -- And Can Obama Handle It? It's taken a week, but it looks like the media is finally coming around to the idea that the current wave of Muslim riots cannot all be blamed on Mitt Romney. That being the case, as the smoke begins to clear and the facts are slowly being accumulated, what is actually going on? Never wrong for long is a tour de force for Roger Cohen. It is a column that is both so spectacularly uninformed, illogical and vitriolic, I don't know how he can hope to match it. ...we here in the Middle East have tonnes of jokes about Allah, the prophets and the angels that are way more offensive, funny and obscene than those poorly-made cartoons, yet no one ever got shot for telling one of those jokes or at least we had never seen rallies and protests against those infidel joke-tellers. What I am referring to is the barrage of material coming into my in-box from readers, much of it connected to the issues of the attacks on US installations abroad, the dangers of radical Islam and Obama's take on all of this. The first thing I note is that I do not do rumors, nor am I likely to share information what "might be true" but is not corroborated or is highly speculative. Thus, I will not be talking about what US Ambassador to Libya John Stevens may have done or what may have been done to him before he was killed. Right now, at least, I will not go there, and perhaps never. In line with the issue of unsubstantiated rumor, I want to mention an e-mail that is making the rounds of the Internet and has now been sent to me more times than I care to count. This is ostensibly written by someone whose brother is a minister living in Jerusalem and sees multiple signs that Israel is about to go to war. Perhaps, indeed, we will hit Iran, but this letter is a hoax, as a close examination of its claims makes clear. Please, if you come into possession of it, do not pass it on. It serves no good purpose. I've just returned to my computer after a beautiful Rosh Hashanah. My time was devoted in the main to prayer, reading and contemplation. Oh, and honey-laden meals with family. Not to mention late afternoon naps. But I will say that several people over the last few days have asked me if I think what has been going on with the attacks on US Embassies has had an effect on the attitude of American voters -- in particular American Jewish voters -- towards Obama and his re-election. My very short answer: I pray so. Much is being made of the anti-Muhammed video, to the extent that the initial attack on the US embassies in Cairo and Benghazi, the murder of US ambassador Chris Stevens and his staff -- and the continuing wave of anti-US protests are all being blamed on that video. Thus the chant of "Obama, we are all Osama" is not supposed to be a reflection of anti-US sentiment, but just a reaction to an insult to Muhammed. But if these protests are in fact due only to the video and are not a reaction to the US in general and the Obama administration in particular -- why is it that Muslims were already chanting "Obama, we are all Osama" 4 months ago back in May? Friedman shows the hypocrisy of such demands citing numerous examples from MEMRI. Here is a video of Barack Obama rapping about "You Didn't Build That", about Mitt Romney, and the 2012 campaign -- sung to the tune of MC Hammer's "U Can't Touch This". The video includes cameos from Clint Eastwood, Stephen Colbert, Hulk Hogan, Julia Gillard, and Jennifer Granholm. Here's the video, followed by the lyrics. In an astute column marred only by a cheap shot directed at Mitt Romney in the end, Ross Douthat correctly concludes that It's not about the video. What we are witnessing, instead, is mostly an exercise in old-fashioned power politics, with a stone-dumb video as a pretext for violence that would have been unleashed on some other excuse. Labels: Muslim Extremists Attack US Embassies In Egypt and Libya, The Disaster of Obama's Policy In The Middle East, Will Israel Attack Iran? Rabbinic Advisory Committee - "An Appreciation of Our Beloved Yeshivat Rabbeinu Yitzchak Elchanan"
Rabbi Dr. Norman Lamm - "Repentance Beyond Sin"
Rabbi Edward Davis - "The Delicate Balance in Creation"
Rabbi Dr. Zalman Levine - "Of Fertility and Faith"
Rabbi Dr. Alex Mondrow - "Teshuvah and the Psychology of Change"
Rabbi Dr. Aaron Ross - "Is there a Mitzva to do Teshuva?" 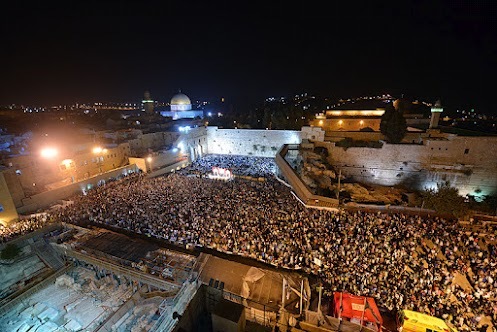 Rabbi Benzion Scheinfeld - "The Enigma of the Prayer Insertions of Aseret Yemai Teshuvah"
Rabbi Ezra Schwartz - "The Minhag of Not Sleeping on Rosh HaShana"
Rabbi Chaim Strauchler - "Our Voices for Our King"
Are All Those Middle East Protests Just Over A Movie? "This is a fairly volatile situation, and it is in response not to U.S. policy, not to, obviously, the administration, not to the American people. It is in response to a video--a film--that we have judged to be reprehensive and disgusting. That in no way justifies any violent reaction to it. But this is not a case of protests directed at the United States, writ large, or at U.S. policy. This is in response to a video that is offensive and--to Muslims." Of course, the Obama administration would have us think that the growing number of riots and protests throughout the Muslim world have nothing to do with Obama's Middle East policy. Barack Obama has come out swinging against his Republican rival, sponsoring television advertisements that ask, "What is Mitt Romney hiding?" The allusion is to such relatively minor matters as Romney's prior tax returns, the date he stopped working for Bain Capital, and the non-public records from his service heading the Salt Lake City Olympics and as governor of Massachusetts. Obama defended his demands that Romney release more information about himself, declaring in Aug. 2012 that "The American people have assumed that if you want to be president of the United States that your life's an open book when it comes to things like your finances." Liberals like Paul Krugman of the New York Times enthusiastically endorse this focus on Mitt Romney's personal history. If Obama and his supporters wish to focus on biography, of course, this is a game two can play. Already, the temperate, mild-mannered Romney criticized Obama's reelection campaign as "based on falsehood and dishonesty" and a television ad went further, asserting that Obama "doesn't tell the truth." This article by Anne Bayefsky appears on PJ Media. While the calamitous consequences of President Obama’s foreign policy are being played out on the Arab street, the Obama-backed UN Human Rights Council is fueling the hatred behind such violence. Today in Geneva during its current session, the Council advertised and facilitated a “parallel” event designed to condemn American troops for human rights atrocities. Legitimization of the Council has been a cornerstone of the President’s so-called engagement policy, and his administration is currently seeking a second-term as a Council member, with elections scheduled for November 12, 2012. And yet in the Council’s Bulletin of parallel meetings today, was an event organized by two UN-accredited non-governmental organizations, one of which had close ties to the regime of Mouammar Kadhafi and the other a devotee of Saddam Hussein. How Much Did US Error Contribute To The Embassy Attacks? The Secretary of State, and by extension, the Chief of Mission (COM), are responsible for developing and implementing security policies and programs that provide for the protection of all U.S. Government personnel (including accompanying dependents) on official duty abroad. As much as attention has been focused on Obama's reactions to the burning of the US embassies in Cairo and Benghazi and the murder of the US ambassador and other personnel -- more focus might be turned on Secretary of State Hillary Clinton. Latma examines the 9/11 attacks on the US embassies from a post-historical perspective and shares a musical Rosh Hashana greeting. Bill Keller, the recently retired executive editor of the New York Times now shares his opinions with the world. The other day he explained how he stopped worrying and learned to love the Iranian bomb. Labels: Muslim Extremists Attack US Embassies In Egypt and Libya, Will Israel Attack Iran? I'm not sure why the US embassy in Armenia would issue such a warning, since there is no major native Muslim population there. Just when we thought that the economy was the issue in the election, we are rudely reminded how events half way across the globe can effect us. The Middle East today, is not the same as the one that President Bush faced, and for all of Obama's talk of having ended Bush's Iraq war, there are events going on that relate directly to how Obama perceives and acts in the Middle East. Why Did The Obama Administration Miss The Signs Of An Embassy Attack on 9/11? While the United States rejects efforts to denigrate the religious beliefs of others, we must all unequivocally oppose the kind of senseless violence that took the lives of these public servants. The question is: just how 'senseless' was this violence, considering the evidence that this was in fact organized in advance and not spontaneous. On September 8 there were calls to burn the US embassy in Cairo over the imprisonment of Sheikh Mujahid Omar Abdel Rahman (Arabic), the blind sheikh behind the first attack on the Twin Towers. This conforms squarely with recent experience in Afghanistan, where seemingly spontaneous riots and attacks in response to Koran-burnings were actually carried out with considerable planning and complicity from the insurgency. The involvement of Jamaa Islamiya should remind us of the difficulty the Obama administration has in distinguishing friends from enemies. Alana Goodman notes in June, the Obama administration invited a member of the terrorist group to the White House. Indeed, there does appear to be a serious problem behind the failure of the Obama administration to prepare for the embassy attacks. The president was scheduled to hold the intelligence meeting at 10:50 a.m. Wednesday, the day after the attacks, but it was canceled so that he could comfort grieving employees at the State Department — as well he should. But instead of rescheduling the intelligence briefing for later in the day, Obama apparently chose to skip it altogether and attend a Las Vegas fundraiser for his re-election campaign. One day after a terrorist attack. Jihadi groups in Egypt, including Islamic Jihad, the Sunni Group, and Al Gamaa Al Islamiyya have issued a statement threatening to burn the U.S. Embassy in Cairo to the ground. A Marine Corps official who would not speak for the record told Danger Room that the Corps did not and currently does not have assets in Benghazi. While the pro-Obama apologists rally around him telling us how really smart Obama is, it would be nice to see him actually leading. Technorati Tag: Obama and Libya and Benghazi and Cairo. Video: Will Jews Decide the 2012 Elections?